How could someone have possibly dreamt up something so bizarre as Halloween? It’s one day in the whole year where people dress up and take to the streets to knock on strangers’ doors and ask them for sweets. I don’t know about everyone else, but when I was five I was told to run away if a stranger offered me a bag of pick-’n’-mix. And yet, many people revel in this opportunity to take advantage of their neighbours and stock up on a few weeks worth of chocolate. But, very few of the people who celebrate Halloween actually know why the day is so significant, nor why we go “trick-or-treat”-ing. It all started with Samhain, the Gaelic festival which marks the end of the harvest season and the beginning of winter. Between the sunset on the 31st of October and the sunset on the 1st of November, people in Ireland, Scotland, and the Isle of Man would acknowledge the transition of seasons. It was considered as a very liminal 24-hours, allowing spirits and fairies to enter the human realm. The people were afraid of these supernatural entities, and felt the need to appease the pagan gods and spirits of nature since they would decide whether their livestock survived the winter or not. To appease the spirits people left “treats” of food and wine on their doorsteps. The death of their livestock wasn’t the only thing these people were afraid of; the souls of the deceased were also thought to visit their homes. To prevent any harm coming to them, they would do two things. The first would be to have a large feast, in which they would invite their dead relatives to protect them. The second thing was to walk around with masks on, so that they looked like ghosts. That way the real ghosts wouldn’t be able to tell that they were human, and so they wouldn’t come to harm. Nowadays, we just wear costumes to scare our friends and have fun! So how did we get to the name “Halloween”? The idea is in the history but not the name. Well, Halloween is a contraction of “All Hallows’ Evening”, which takes place the day before the Western Christian feast on All Hallows’ Day. The feast takes place to remember deceased saints (hallows) and martyrs, as well as followers of Christianity who are no longer with us. The Christian Church used the notion of death from Samhain for their own uses. The idea is to laugh in the face of death, to confront and ridicule it – hence, in this instance, the need for scary costumes. 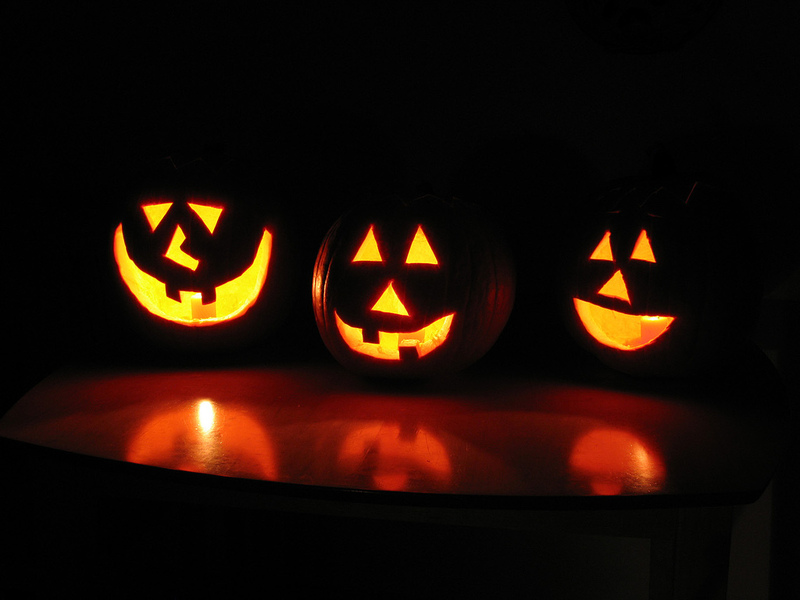 During this medieval celebration of Halloween, two new traditions were brought into play: souling and guising. Souling was practiced on the 2nd of November, on “All Souls Day”, where people in poverty would beg for “Soul Cakes”, and in return would pray for dead people’s relatives. Meanwhile, guising was basically an olden-day version of the trick-or-treat we all know and love. People would dress up and exchange singing, poetry, or jokes for food. However, the term “trick-or-treat” didn’t come into being for a while afterwards, and largely focused on the “tricking” part. You might still be left wondering things like “what about traditions such as carving pumpkins?” Well, it didn’t start with the pumpkin, but the turnip. Whilst souling, the Catholic children used to carry turnip lanterns to represent the souls of the dead. In some parts of Great Britain, this was then transformed into a device for scaring people on the roads. Young boys would carve the gruesome faces into the lanterns, much as we carve witches and scary faces into our pumpkins today! Perhaps we would be surprised if full-grown adults were reduced to hysterics at the sight of a carved pumpkin, but, apparently, it actually used to happen. Today Halloween is a massive business and the second-most commercial holiday of the year. Perhaps it has lost it’s roots; I’m certainly not thinking of my livestock or deceased saints why I dress up, carve pumpkins, decorate my house, eat toffee apples, and egg my neighbour’s car. Regardless, it is still interesting to recognise the historical origins that modern-day fun is built upon.